Michael Laverty secured his best finish of the season by taking 12th place in the Malaysian MotoGP round at Sepang. The Toomebridge rider came home one place ahead of Paul Bird Motorsport team-mate Broc Parkes for his second points score in a row. Laverty was 13th in last week's Australian MotoGP at Phillip Island. The race in Malaysia represented Laverty's penultimate appearance in the global series, with the final round to be held in Valencia on 9 November. 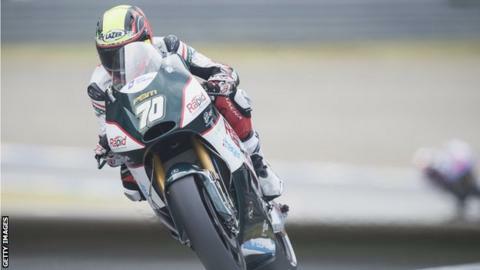 Laverty is set to return to the British Superbike series next year, probably with Bird's Cumbria-based team. The former British Supersport champion picks up four points for his 12th position in Malaysia and has now accumulated nine points over the course of the season to lie 24th in the overall standings. He finished almost one minute 18 seconds behind race winner Marc Marquez. Spaniard Marquez claimed his 12th win of the season on his Repsol Honda to equal the record set by Australian Mick Doohan. The world champion saw off a strong challenge from Yamaha-mounted Valentino Rossi, with Jorge Lorenzo third of the 14 finishers.